Suzan Marshall above the spot where her husband's body was found in the Spokane River last year. 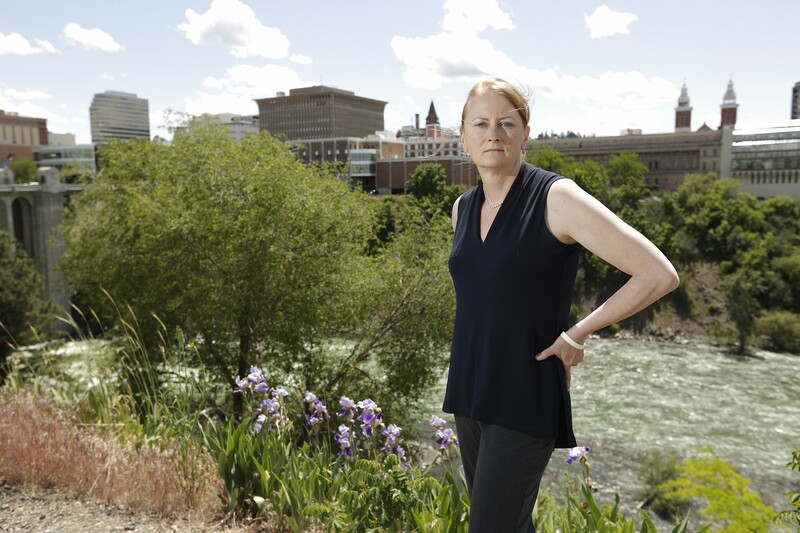 Dr. Suzan Marshall still doesn't know for sure what happened to her husband, John, whose body was found in the Spokane River in January 2016. Marshall, who is a surgeon, has been highly critical of the Spokane County medical examiners' work on her husband's case, as well as in several other death investigations. John Marshall's death was ultimately ruled an accidental drowning by Spokane County Medical Examiner Dr. John Howard — a conclusion that Marshall disagrees with. In the year and a half since her husband's death, Marshall has led an effort to identify other cases where families question the medical examiners' official rulings. Earlier this year, she filed a complaint against Howard and Dr. Sally Aiken, the county's other medical examiner, with the state Department of Health, citing her husband's case and three others. A Department of Health spokesman says a total of about 10 complaints have been filed against Spokane's pathologists. Marshall has also been vocal in her criticisms of law enforcement. Now, Marshall says, someone is retaliating against her. Less than a week after the Inlander published a cover story earlier this month that included Marshall's critical comments, she received a letter saying that someone had filed a complaint with the DOH accusing her of "practicing beyond scope of practice." The letter dated June 14, 2017, says the Board of Osteopathic Medicine within the state Department of Health is investigating the complaint, but it does not identify who filed it, or what specific event triggered the alleged misconduct. "We are bound by two different laws, which may seem in conflict," the letter reads. "The first requires that we immediately notify you that a complaint has been filed. The second, the whistleblower law ... prohibits us from identifying the name of the complainant until we have received a signed waiver allowing us to do so." "It's absolutely about giving my opinions as a trauma surgeon on autopsies," Marshall says of the accusations against her. She notes that she is not currently treating patients or practicing medicine, though DOH records show that her medical license is active. "I'm not outside my scope, and I'm perfectly happy for the medical board to verify that for everybody." DOH spokesperson David Johnson says complainants can remain anonymous, but that could limit the department's ability to fully investigate. The Spokane County Medical Examiner's Office did not immediately respond to requests for comment. We'll update this post if we hear back. Notably, one week after the Spokesman-Review reported April 30, 2017, on the state's investigation into Drs. Aiken and Howard, Aiken requested a "copy of all [public records requests] submitted to Spokane County by Suzan Entwistle Marshall," according to county records. Aiken's request is dated May 3, 2017. Suzan Marshall's husband went missing Jan. 25, 2016, during an early morning jog. John Marshall's body was found floating in the Spokane River the next day, and Howard ruled the death an accidental drowning. Suzan Marshall believes her husband was beaten to death and his body was dumped into the river, based on her review of the autopsy and photos of his body. Marshall is also critical of the medical examiners' work in other deaths, calling some autopsy reports "ludicrous" for their conclusions. In one example, Howard ruled the cause and manner of death was "undetermined" for a woman whose body was cut in two and disposed in two plastic bags. The complaint against Marshall does not appear to accuse her of other state law violations that could be considered "unprofessional conduct," such as "commission of any act involving moral turpitude, dishonesty or corruption relating to the practice of a person's profession" and "misrepresentation or fraud in any aspect of the conduct of the business or profession." The accusation of practicing beyond the scope of practice "can be interpreted as allegations around doing something that the person doesn't have the training and/or license to do or conduct," says Johnson, the DOH spokesperson. What Happened to John Marshall?